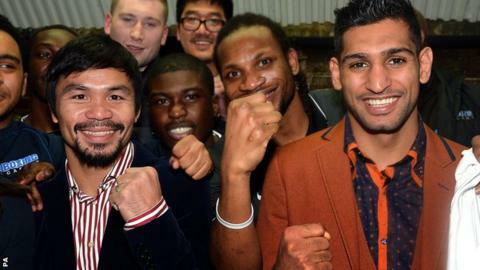 Amir Khan met with Manny Pacquiao in London on Friday to hold talks over a potential fight at Wembley Stadium. The British welterweight, 28, trained alongside the former pound-for-pound champion for several years under ex-trainer Freddie Roach and always maintained they could never fight. But both are now open to meeting and spoke at Fitzroy Lodge Boxing Club. However, the 36-year-old Pacquiao's priority remains securing a fight with Floyd Mayweather in May. "Even though we have that friendship, if it makes sense then it's a fight that can certainly happen between us," Khan said. "I want to fight the biggest and best names out there and Manny is definitely among them." Khan and Pacquiao have both sought a bout with the world's top fighter in recent years without success. Mayweather's team spoke with Khan's last year before opting to fight Marcos Maidana twice, while Philippine great Pacquiao is yet to meet the 37-year-old American despite years of wrangling. Will Khan have to wait on Pacquiao/Mayweather? Pacquiao and Mayweather are considered the best fighters of their generation and have long been touted to meet in a blockbuster bout, and that could finally happen this year. Eight-division champion Pacquiao is the holder of the WBO belt, while Mayweather is the WBC and WBA champion. However, on arrival at Fitzroy Lodge, Pacquiao told the Daily Mail: "I think now that Floyd and me is going to happen. It looks like it." Pacquiao's advisor Michael Koncz added: "Just in case Floyd doesn't come through we regard Amir as the best possible alternative. "He and Manny would make for a very exciting fight and Manny would be more than happy to do it at Wembley Stadium. We are looking at that possibility and also Abu Dhabi." Khan delivered arguably a career-best performance when he won a landslide decision victory over American Devon Alexander in December. Pacquiao defeated Chris Algieri on a unanimous points decision in his most recent fight in November.